Fine. 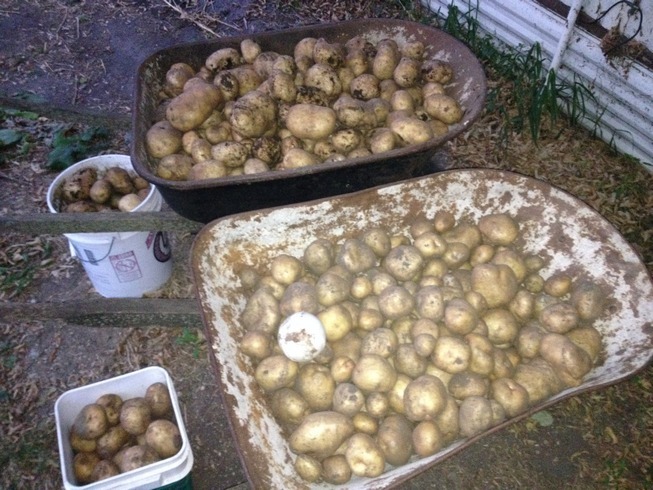 Here they are, pics of my potato haul. 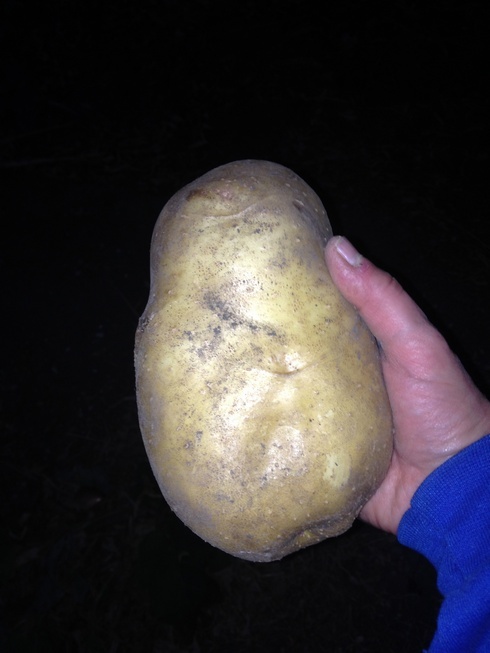 We grow Yukon Gold potatoes from last year’s leftovers we didn’t get a chance to eat. There might be some Russets involved, but mostly the Yukons. Yes, that is the same plastic softball I used for size comparison with the onions. 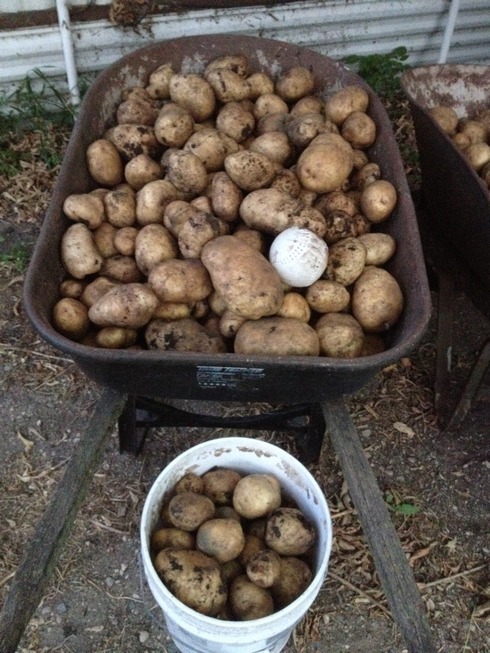 And I already dug a bunch of potatoes earlier in the year, so all told, both barrows would be full. Gotta go. Enjoy your week before the madness! Categories: gardening, Inspiration, NaNoWriMo, Writing | Tags: gardening, humor, muse, nano, nanowrimo, writers | Permalink. Catchy title, eh? I’ve been catching up on reading the blogs I follow, and there seems to be a lot more about NaNo this year in particular than I remember in years past. Maybe it’s because more writers have decided to throw their towel–er, hat in the ring of madness that is NaNo. This post, in particular, summarizes NaNo quite well. I did my NaNo this year in February, so even though I’ll be posting my numbers from Feb each day, I’ll be working on revisions of that novel. Okay, so I kinda bent the truth a little in my title. But really, the post isn’t entirely about NaNoWriMo. Remember those days back in college? You know the ones, especially those first days of your freshman year, when you were still working through the reality of living on your own, with new classes in different buildings, new people to meet, and the responsibility of going to classes, doing homework, finding a job, and all the other new experiences (dorm roommate, anyone?) that go with it. There’s an atmosphere on college campuses, I think, that can bring us back to that time in our lives. This past week was MEA (MN Educators Association) week, so the kids had Thursday and Friday off from school. This is a perfect time for colleges to hold open houses for high school seniors. My son is a senior this year, and on Friday headed off to one college open house with my hubby and his aunt (hubby’s sister), since I was working. On Saturday, we headed to another open house at the college I attended twenty-five (OMG! Holy crap I’m getting old!) years ago. Boy, talk about a time warp. Some parts of the campus looked just like I remember, but there’s been so much new stuff (skyways? We never had skyways when I went there) added, I hardly recognized it. But just being there reminded me of those days I walked the campus. And that, in turn, made me wonder where all the friends I’d made back then ended up. One friend shared my love for Airwolf, and shared a treasure trove of fanfic with me (there was no Wattpad or FanFiction.net back then). Another invited me on a trip to the Oshkosh EAA air show (that’s a post all by itself) with 6 other members of the flying club. The trip also made me realize how much I’ve changed since then. After my initial attempt to accept that yes, I’m older and now my son is getting ready to head to college, I realize how my life journey has circled around to (sort of) where I was back then. I wrote my first book during my grade school years, my second book through high school, and a fun play starring me and my closest friends (which we won’t ever mention again 😉 ), then took a sojourn from writing while I was in thrall with aviation. I started writing again when I took an English class in MI, and progressed to the point of getting a couple short stories published before my son was born. I didn’t get back to writing until later. I started writing fantasy and science fiction, and I’m writing mystery now. What a tour! Has your life journey taken you away from writing? When did you return to it? Did you learn of your writing passion later in life? I sometimes wonder if I should’ve gone into an English major, but at the time, I wanted to be involved with aviation, then computers (well, always computers). Now, I write for a living (I’m a tech writer, so I do get a regular paycheck 😉 ) and I’m trying to join the ranks of published authors everywhere. I wonder if this is where I was headed the entire time. I like to think I just took the scenic route. Lots of great experiences along the way, and I think I’m close to that place in my life I’ve wanted, but I just didn’t know it. How about you? Are you close to that place in life you’ve learned you want or need to be? Categories: Authors, Inspiration, NaNoWriMo, Writing | Tags: Inspiration, mystery, nano, nanowrimo, writers | Permalink. Guess what? It’s October–wait for it–I’m in Minnesota, it’s the second week of October, and it was almost 90 degrees yesterday. I know, right? It’s been so nice the past month that my tomatoes are setting new fruit. Yes, you read that right. I’ve got fresh leaves and green tomatoes on my plants. Normally, we’d have had a light frost by now that would’ve killed the plants. Yesterday was summer. The day before was a super-nice, mid-seventies fall day. Today, less nice, less summer, more blustery fall. Wind, clouds, and an almost-forty-degree temperature drop from yesterday. Gotta love Minnesota weather. Fifties today, and the weather geeks are predicting frost by the weekend. Talk about weather whiplash! Okay, I have to brag a bit. Remember the jaunt through the garden a couple posts back? 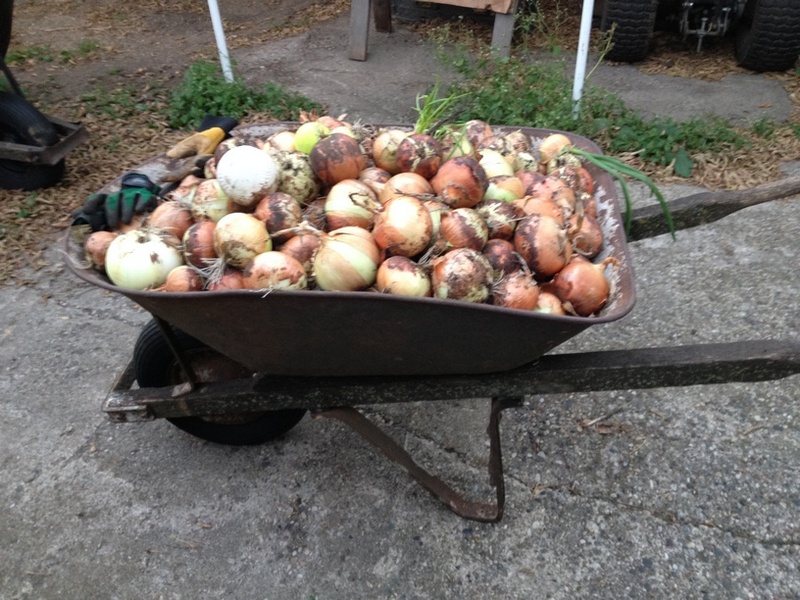 I mentioned onions the size of softballs–bet you didn’t believe me, did you? Since it was so nice yesterday, I drafted my daughter to help me pick the onions. I knew we’d have a good haul, but OMG, this is a bit of overkill for a family of four, even if we use onions in just about everything. See that white ball? It’s a plastic facsimile of a softball (couldn’t find a real softball). I’m not sure weight-wise what we ended up with. We’ll leave them outside on box screens to cure for a while. Usually we’re good with one screen, which is about four feet by seven feet or so. This year, we needed a second screen. The air circulation is important; the onions need to develop a tough skin so they last longer in storage. 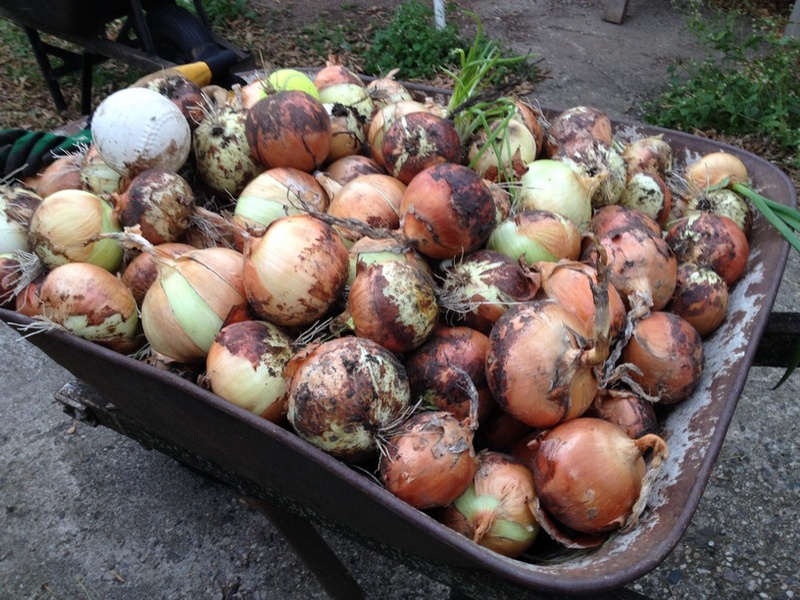 The past couple years have been lousy for onions–they kept getting washed out by heavy spring/summer rains. This year’s been superb for just about everything. Next on the docket: digging potatoes. I’ll have to wait until the onions have cured for a week or two before digging the potatoes. The potatoes will need to cure as well once they’re out of the ground so the skins will thicken a bit. Ugh. I love to eat them, but they smell worse than broccoli when cooking. He’s messing with me. Enjoy the remaining days of colored leaves. This year’s been absolutely beautiful. I’ll try to catch a few of the spectacular colors in the next few days and share them with you. Two weeks left to prep for NaNo. Are you ready? Categories: gardening, Inspiration, NaNoWriMo, Writing | Tags: gardening, muse, nanowrimo, seasons | Permalink. Ah, it’s my favorite season (followed closely by spring). The weather is comfortable, the sky is brilliant, the leaves are changing, and the garden is winding down. The worst part about autumn is knowing winter is coming. I can do about a month of winter, maybe two, before I start going crazy. Now’s the time I’d normally spend putting together my outline for NaNoWriMo this year. I say normally, because I’ve already done my NaNo for the year–in February. Yep, 50k+ words in 28 days. That doesn’t mean I’m going to blow off NaNo in November. I figure, the point of NaNo is to write every day. It’s about this time every year I’ve lost that habit, and I need a refresher course. This year, I plan on spending the time revising my WIP (written in Feb). I tracked my stats in February, so I’ll post those to the NaNo site, but I need to do a major overhaul, and NaNo is the perfect excuse/incentive to do so. I seen a few fellow writers post about maybe doing NaNo this year (Emily, I challenge you!) I’ve said it before: I feel the most important reason for doing NaNoWriMo is to develop the habit of writing every day. If you don’t, it’s a lot harder to hit the 50k word goal line. Granted, if you don’t hit 50k, no one’s going to stop by your house and hang a “Loser” banner or anything, but it gives you a target. Bonus, if you do hit 50k or more, chances are you’ve got a rough draft of a completed novel on your hands. Just think, writing a novel in a month. Sure, it’s crap–it’s a rough first draft–but no matter how long it takes you to write a book, you’ll have to revise it (unless you’re George R. R. Martin, but that’s why it takes him years to finish his books). Join me and the other 100k writers on a NaNo Noveling journey. Now’s the time to lay out your plans for your NaNo novel. I never used to outline, but the first year I did NaNo, I outlined a fresh story, one I hadn’t been mulling over in my head. I was surprised at how well it helped me develop the story. Ever since, I’ve taken October to outline my NaNo novels and do some research. Some writers just “pants” it–write by the seat of their pants. It works for them, and might work for you as well. October is also Halloween. Okay, technically only the 31st is Halloween, but it seems like the foreplay lasts the entire month. I know people who celebrate Halloween like we celebrate Christmas: jump in with both feet at the beginning of the month and fill every day with little bits of the season. One writer has her Halloween mystery on special this month. Another writer has an October tradition he calls Macabre Macaroni. I don’t get caught up in the whole H’ween thing, but I think people who like the season have a lot of fun with it. I’ll settle for colored leaves, Honeycrisp apples, and hot mulled cider (I’ll take hard cider if it’s available). Enjoy the new season, and enjoy your upcoming week. I’m off for a run, then the Vikings’ game. They’re taking on Denver today. Categories: Authors, Inspiration, NaNoWriMo, Writing | Tags: creativity, Halloween, nano, nanowrimo, seasons, writers | Permalink.